The more I think about it, the angrier I get. 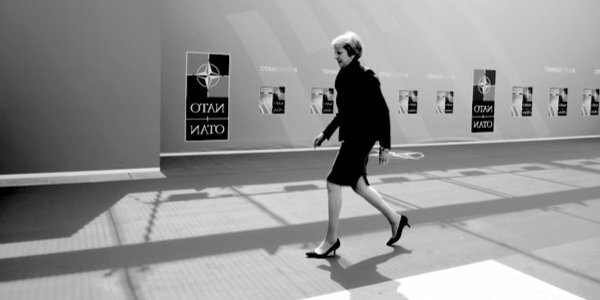 Theresa May’s Dancing Queen routine was not only unfunny, but a grievous insult to Britain’s war dead: here is a woman whose quarter-baked Brexit plan signs us up to effective colonial status – a complete reverse of what we voted for and which better generations fought and died to prevent. The Dancing Queen was dancing on their graves: as she approached that conference podium, she might as well have been crushing red poppies beneath her kitten heels. Of course, politics has always had its silly side. Before the days of television cameras, the effects of a good lunch made themselves noticed during parliamentary debates. The great Parliamentarian Michael Foot once complained about having to contend with a ‘semi-drunken Tory brawl’. Cue howls of indignation and a demand from the Speaker to withdraw. Foot, beautifully, said he would indeed withdraw, but added that the Opposition had been barracking him earlier in the day when sober, and were now doing so ‘while in a different condition’. Cue more outrage. Such interludes can act as light relief from the fact that politics is mostly a dry, deadly serious business, but ever since Brexit became a ‘thing’ the only seriousness on display has been the ruthless, immoral way much of the executive and elites have sought to frustrate it. May’s Peter Crouch tribute act might have been acceptable if she had spent the last two years fighting like a tiger to implement the will of the people, but of course she hasn’t and in her conference speech couldn’t even bring herself to mention Chequers by name. Contemptuous, gutless and pathetic. If the executive has behaved with a devious ruthlessness, Parliament has utterly failed to hold it to account, preferring to play its inward-looking Game of Thrones while the people look on in ever greater disgust. On the Tory side, Remainers have had tantrums, centrists have quivered, the ERG has sabre-rattled. Labour is even worse, not even pretending to stand by its manifesto commitment and playing a cynical, opportunist game to try to bring down the government. A few statesmen and women aside, Parliament has behaved like an child who has been given a task too big for it and instead runs outside to play in the garden. Paradoxically, one of the few to emerge with any kind of honour is Boris Johnson, often thought to be a buffoon. Yes, he may have bottled ousting May, but at least he resigned from Cabinet and has tried to communicate the gravity of the constitutional threat we now face. Politicians just do not get it. It is not just the threat of the Chequers vassalage to our country, great though that is, it is a threat to Parliament and their entire profession. As the communications revolution has progressed, and particularly since the advent of the internet, the necessity-based case for a purely representative system of democracy has grown weaker and weaker. Its justification now rests entirely on ethos, namely that our elected representatives understand it is their onerous task to discuss difficult and sensitive issues in a morally serious way and with great respect for the electorate, leaving us to get on with our lives. What we actually get is the precise inverse: the great issues of our time, such as Europe, Islam, Western decline, immigration, demographic change, family breakdown have all been largely ignored or trivialised. Politicians prefer to concentrate on mid-level matters, or even worse, impose far-reaching, unwanted and unasked-for change on the sly. In Brexit, our leaders, our parties and our parliament had one last, glorious chance to redeem themselves and they have fluffed it spectacularly. The great issue has illuminated for all to see that we do not have representative democracy, but an unrepresentative shamocracy. Indeed, perhaps we always have. Either way, it will not long survive the Brexit betrayal. Chequers, or anything like it, spells chequemate for Parliament. We, the people, will truly ‘take back control’. Next articleIf Russia attacks . . .